Whenever friends watch me in the kitchen, I’m pretty sure I make them nervous. “How do you ever know how much seasoning to put in without measuring?”they always question. At first I thought it had something to do with my Type A friends watching a “Type Z” friend cook, but then I realized that there are those who follow recipes to a “T” and those that improvise as they go. Yet, one of my sister in laws confessed to stopping right in the middle of a recipe because she reached an ingredient that she didn’t have on hand. She wasted the entire thing because she just “knew” the whole recipe wouldn’t turn out with the missing ingredient. Now, we can’t have. Everyone needs to feel comfortable enough in the kitchen that they can ad-lib to some small degree and I believe that one of the best ways to begin is by understanding some simple spice and seasoning mixtures. I had such fun going back and reading an older post, “Following recipes: To Read or not to Read.” Now granted, the comments were my favorite part, but many of those women answering were home cooks. I made the point of watching the Food Network. You never see chefs following recipes and even on one of my favorite shows, “Worst Cook in America,” they are charged with learning as they go, tasting as they go, enhancing the flavor base as they proceed through the meal. Hopefully, these five super easy seasoning and rub recipes will help you start connecting what spices go with what flavor bases. 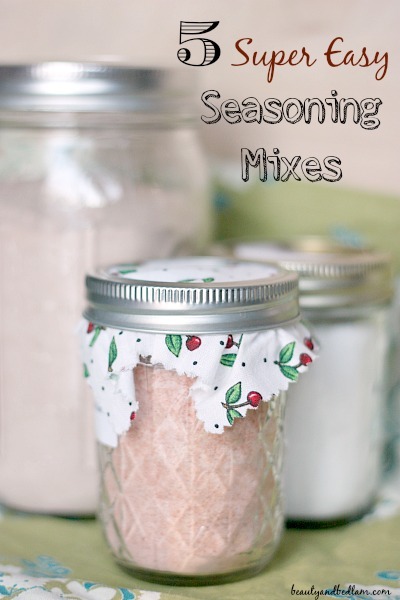 Honestly, take five minutes, grab all your seasonings, and start mixing them together. Also know that the measurements given are not large quantities, so feel free to double or triple the amounts for bulk storage. 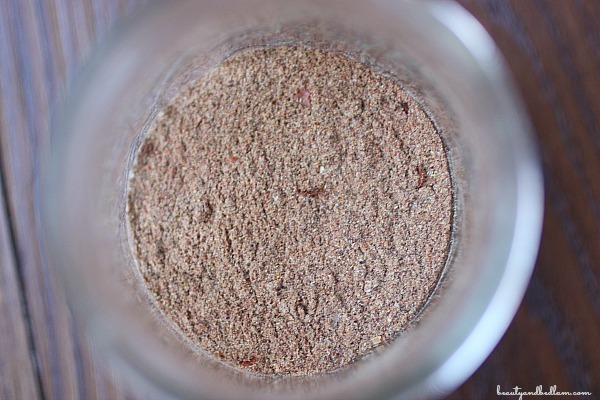 I’ve already shared my favorite Easy Homemade Taco Seasoning recipe. I mix it up in bulk and we go through it quickly. Even our kids use it on everything. They make up taco mix nearly every day and this is a staple mixed right in with the salsa and sour cream. And don’t forget, while you are digging around in that pantry, print off one of my Pantry Spice Inventory Check Lists to help you get them organized. You will so glad you did. Combine 2 Tablespoons dried basil leaves and 1 TB. seasoning salt with 2 teaspoons garlic powder and 1/2 teaspoon pepper. Combine 2 Tablespoons garlic powder with 1 1/3 TB salt, 2 TB. dried basil, 2 TB dried thyme, 1 TB cayenne pepper, 2 tsp. onion powder and 1 tsp. black pepper. Combine 5 teaspoons chili powder, 6 teaspoons ground cumin and 4 tsp. garlic salt with 2 tsp dried oregano leaves and 2 tsp. black pepper. Combine 1/2 cup packed brown sugar with 4 tablespoons soy sauce, 2 teaspoon garlic powder, 2 tsp. ginger and 1/2 tsp. cayenne pepper (or more for heat, plus 1/2 tsp red pepper flakes). Combine 2 TB. vegetable oil with 4 tsp. ground allspice, 2 tsp dried thyme, 2 tsp. salt, 2 tsp paprika and 2 tsp cayenne pepper.